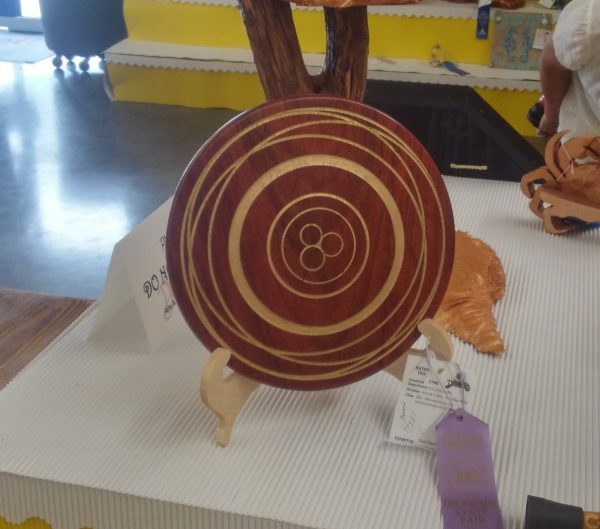 The Club’s woodturning display at the 2018 Delaware State Fair was very well received. A lot of people stopping by to admire the turned items, to ask questions about our club, and to inquire about the process involved in making them. People especially like the natural edged bowls. 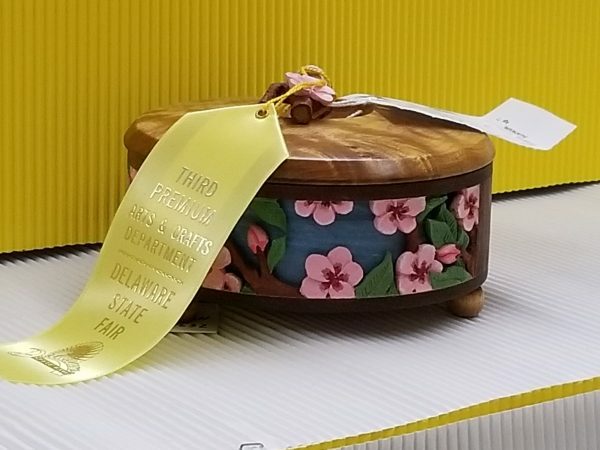 The pieces that were submitted for judging did very well, with Eric Krum’s three (3) turned spindle boxes earning the Judges Award for Woodworking and First Place in the Miscellaneous Woodworking category. The bases and boxes are made out of Logwood (Haematoxylum campechianum), which is one of the few red woods that gets redder as it ages. The stems and finials were turned out of Gabon Ebony (Diospyros crassiflora). 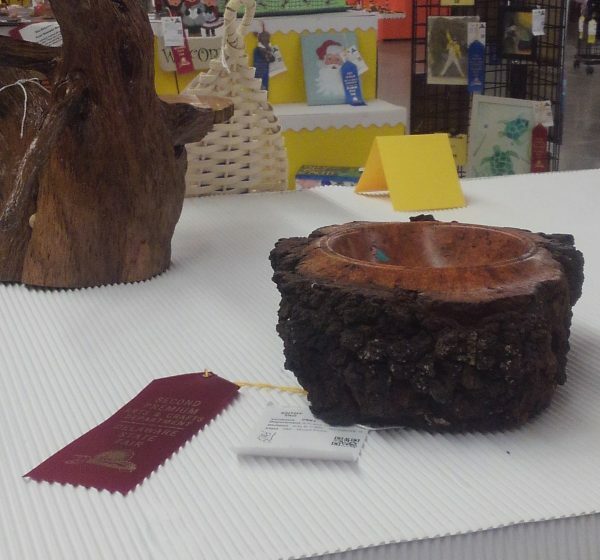 Mike Okner’s beautifully crafted bowl won first place in the Bowls category. The bowl received a lot of comments on the artwork Mike added to the side, and on how thin the sides were. Unfortunately, the painting is not visible in this photo, however another photo from the June meeting was posted to the FSW Photo Archive . 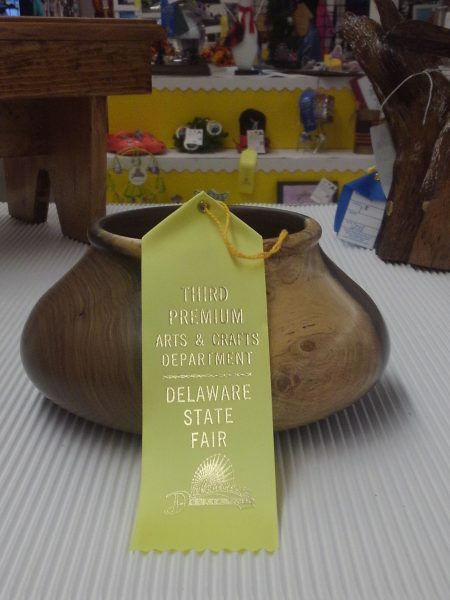 John Bacino’s bowl with the embedded turquois won the red Second Place ribbon. 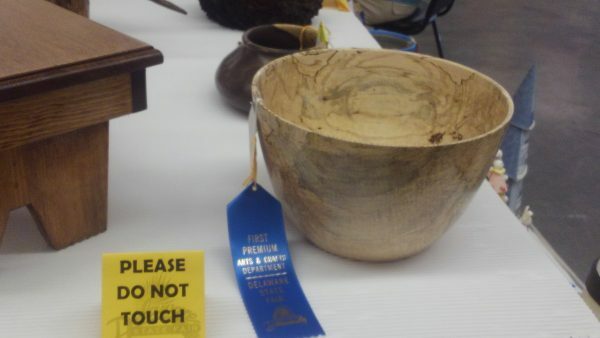 Eric Krum’s bowl made out of Blue Mahoe came in Third Place. David Beehler’s platter with the beautifully done gold inlay won Honorable Mention. 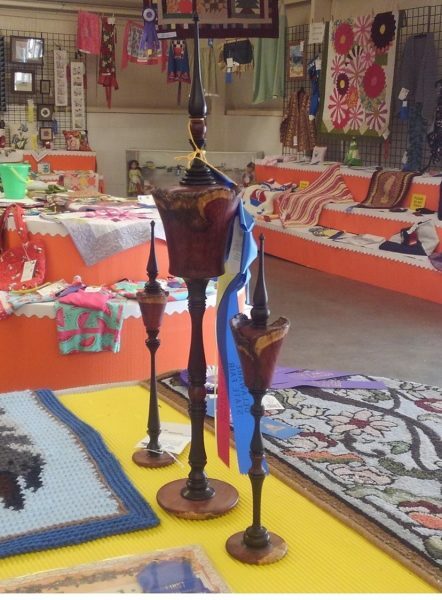 Ron Wilson’s earned the Third Place ribbon in the Miscellaneous Woodworking category. 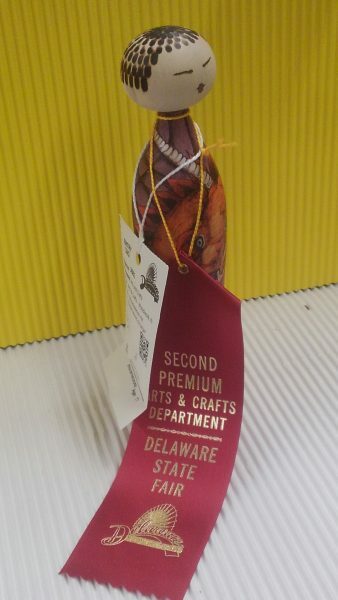 Steve Childers and his daughter Sammi’s turned and painted Kokeshi doll won a Second Place ribbon. 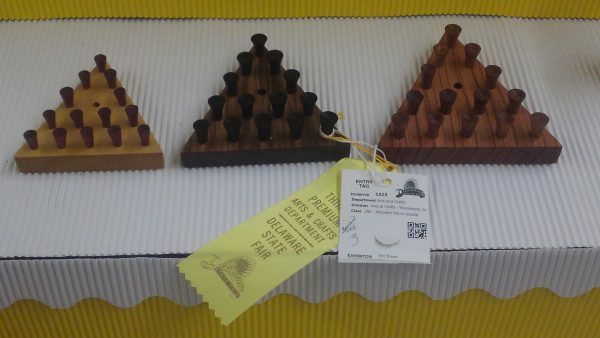 Eric Krum’s set of three (3) Peg Puzzles won a Third Place ribbon in the Games & Puzzles category. 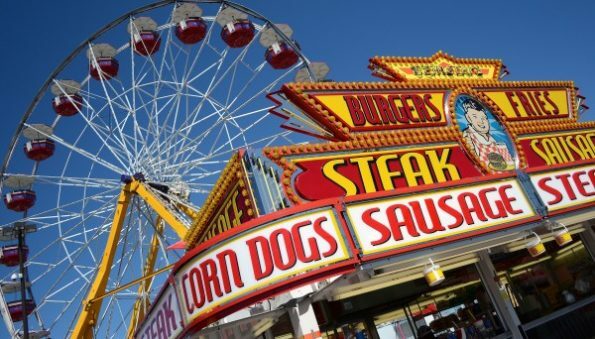 Congratulations to all the members who entered an item for judging. A job well done! Would like to have seen more of (for example…) Eric’s Blue Mahoe bowl. The ribbon blocked a lot of it. Award could be in text/title of picture. Perhaps he and others will bring there entries (that we have not seen before) to a meeting? Will bring in the bowl and other items into the August meeting.